Anne Welsh is a poor woman with no marriage prospects, and no future. Desperate to get out of her sister’s small house, she accepts the only offer of marriage she received from a man in Texas, who turns out to be very cruel. One night, she can’t take his wretchedness anymore and decides to flee. When a handsome, young rancher discovers her seeking shelter in his barn the next morning, Anne finds herself in an entirely new life. Who is this handsome rancher, and why is he being so generous to Anne? Timothy Williams lives a pleasant life on his small ranch in Texas. He has ignored his mother’s insistence that he marry for years, but that all changes when she tells him that he must get married, otherwise he will lose his precious ranch. His mother chooses a young woman for him, but Timothy refuses to marry a woman who is so clumsy and quiet. Out of desperation, he finds a bride in Matrimonial News who is beautiful and seems to be everything he wants in a wife. Will Timothy find happiness, or will he learn that everyone is not as they seem upon first impression? Haddie Johnson has a loving husband that she had known since childhood, and a baby girl, who is just months old. Everything is wonderful…until her husband falls ill with a high fever and passes away. She realizes that life will never be the same and she must do everything she can to provide a comfortable life for her daughter and herself. 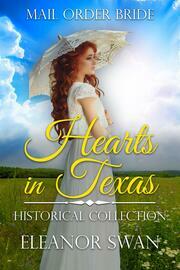 Reluctantly, she agrees to marry a man named Jack who lives in Texas. Jack is nothing like her first husband, and she worries that she is destined for a life of unhappiness. However, when a life-changing event draws them together, Jack and Haddie discover a truth about themselves that will either make or break them. Josephine Matthews is an orphan living in New York City. She dreams of traveling and living a life where she no longer has to struggle to survive. After losing her job, Josephine is desperate to start a new life. She writes to a man named Patrick in Texas looking for a wife and is overjoyed when he responds. The relationship seems to be going well after Josephine arrives in Texas. However, after an unexpected letter arrives from New York City, her world is turned upside down. Will she choose to stay with Patrick, or will she choose a life that she always dreamed about? If you love inspirational historical western and mail order bride romance books with twists and turns, you will love this sweet romance collection. Authors Note: These are clean, stand-alone romance, so there are no cliffhangers. The books are 15,000-word books.